The National Weather Service determined in a preliminary report that the strength of a tornado that swept through Port Orchard was an EF-2. The tornado that swept through Port Orchard on Tuesday was rated at an EF-2 making it the strongest tornado to hit Washington since 1986. A preliminary damage assessment released Wednesday from the National Weather Service found the tornado reached speeds of 120-130 mph. The tornado, which was between 250 and 300 yards wide, started on Geiger Road about two miles south of Port Orchard and ended on Southeast Kerri Court about two miles southeast of Port Orchard. It traveled 1.4 miles. The heaviest damage was in the Harris Road-Tiburon Court area, according to Kitsap County Emergency Management. The weather service noted “significant” tree and structure damage along its path. Aerial footage of the tornado's path showed trees uprooted, homes with roofs torn off, and trees fallen on top of structures. 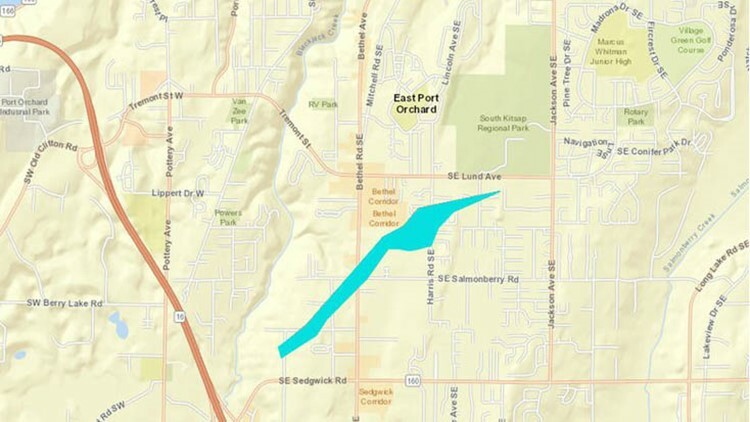 An EF-2 tornado that swept through Port Orchard traveled 1.4 miles from Geiger Road to Southeast Kerri Court. Aaron and Tawnia Crain were at their home just off Harris Road when the tornado touched down. "I heard a buzzing sound, a real loud one," Aaron recalled Wednesday. "The glass went berserk, and I could see the roof coming of the neighbor's house." "Our bedroom door ripped off the hinges, hit me in the head, and continued sailing down the hallway towards him (Aaron)," said Tawnia. The couple said that's when a tall timber came crashing down on top of their home and pinned their daughter inside a bathroom. Their daughter needed stitches, but the family was thankful they were alive to tell the tale. "We're just blessed that we're here, we can rebuild, this will not break us, this will not determine who we are. We're stronger than any house," said Tawnia. Approximately 250 structures were damaged in the storm, according to Kitsap County Emergency Management. Of those structures, 11 received red tags, which means they are unsafe to occupy, 12 got yellow tags, which means safety is questionable and they're off-limits to unauthorized personnel, and 160 got green tags, which means there's no restrictions on use or occupancy. Emergency management previously reported 450 homes were damaged. Trees fell in multiple directions around Mary Hicks’ home, but unlike her neighbors, one did not make a direct strike. "We had a beautiful 25-foot rhododendron - that was in the center here it up rooted - we've lost that. My grandmother had planted in 1958," said Hicks, as an impromptu work party continued outside her home. "The older couple across the street, they're not able to live in their home,” Hicks continued. “It takes some time to realize, you know, how devastating it is to this community." James Williams, owner of Rainy Day Exteriors, said he and his crew plan to clean up debris and board up houses on Thursday. They have tarps and plywood to cover houses and windows. Williams says they will go wherever their help is needed. Teams are expected to continue inspections until after dark, according to Kitsap County Emergency Management. Homeowners with identification can check in with law enforcement at road closures to gain access to restricted areas. If homeowners are working with contractors or insurance adjusters and need access to restricted areas, they should go to the Christian Life Center at 1780 Lincoln Avenue Southeast, Port Orchard. There were no reports of serious injuries in the tornado, which Logan Johnson with the National Weather Service called "a blessing." The Red Cross mobilized a response to the damage. An emergency evacuation center opened at St. Gabriel Roman Catholic Church at 1150 Mitchell Avenue Southeast in Port Orchard for people who need a safe place until they can return home. The determination of the tornado's strength is subject to change based on further assessment, according to the weather service. Tornado strength is based on the Enhanced Fujita scale, which is defined by estimated wind speeds and damage. It has six categories ranging from an EF-0, which causes minor damage, to an EF-5, which causes incredible damage. An EF-2, which Port Orchard experienced, has wind speeds from 111-135 mph and causes considerable damage. Tornadoes in Washington are very rare; on average Washington sees just two or three per year. In Kitsap County there has only been one tornado other than Tuesday's. That tornado was in Tracyton in 1991 and pelted the area with record-setting hail, according to the National Oceanic and Atmospheric Association. Port Orchard's tornado was likely formed from a combination of horizontal wind shear – or a variation in wind speed – and a strong upward motion in the thunderstorm, according to KING 5 Meteorologist Ben Dery. When conditions are right, that can trigger rotation near the ground, forming a tornado. RELATED: How did a tornado form in Kitsap County? However, National Weather Service Senior Meteorologist Courtney Obergfell said tornadoes can form very quickly and dissipate within minutes, which makes them difficult to predict. The thunderstorm that caused the Port Orchard tornado was also about 10,000 feet high and too weak for officials to see any clear signature of circulation on the radar, so no tornado warning was issued, according to KING 5 Meteorologist Darren Peck. WATCH: How do tornadoes form?